Ha, thanks for the mention Keizo! My humble opinion but I agree any deviation from the Shoyu flavor leaves me slightly hanging as well. 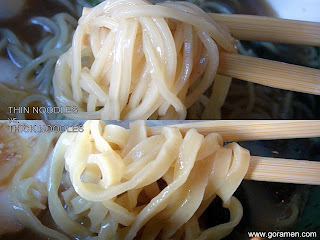 A mild miso flavored shoyu or mild tonkotsu flavored shoyu.. I think the straight Shoyu has the strongest identity here. Still I appreciate them because it's a nice change when I get tired of the "mall ramen".. I'm tell'n ya, it's slim pickings down here! Can't wait for your end of year top ten list btw!! Hey Dennis! I knew you'd be the first to comment...haha. I know what you mean. No need to be nervous! :) I noticed after I ordered that they had a daily special of Mabo ramen and Kakuni Ramen. I thought about canceling my order but didn't. Have you tried either? Are they any good? I kinda feel like driving back down just to try them. There is a big difference between the shoyu from here vs Chopstix. Too bad about the chasu, but at least everything else seemed to be in order. Keizo, did this place lived to the hype in SD? Not really. I actually expected something better, but it was still the best out of the 3 that day. I would love to go back and try the other ramen on the menu...someday. That egg *does* look good. How does it compare to say Kohryu's? Hi ed! For the most part, the egg is very similar to Kohryu's, but Tajima has a slightly better aji.